Gentle, bubbling waters flow from our sculptural fountain, bringing tranquility to any room in your home. 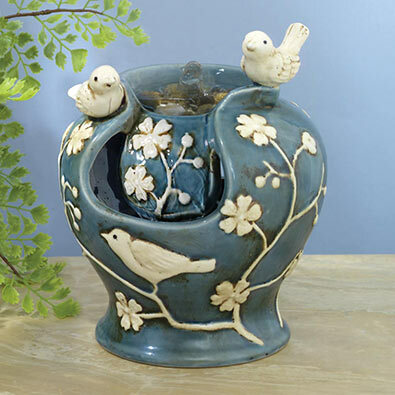 Two perched birds are alight on the rim, filled with real river stones for a natural feel. Crafted of soft blue and cream glazed porcelain with an antiqued finish. Electric adjustable pump contains a 6" cord for optimal placement. Measures 7-1/2" high x 6" in diameter. Minor assembly required.